Stove enamelled black metal background with Murano ruby red crystal neon glass. Vladimir Lenin was enthusiastic about new mass communication technology like the radio and the gramophone and its capacity for educating Russia’s mostly illiterate peasant population. What would he have thought of the 12″? The artists have taken a piece of Russian ‘propaganda art’ in Lenin’s head , blinged it up with shining chrome and given it a new spin – on the dancefloor. A new body too – Revolutionary Art Frankenstein. Lenin was as revolutionary as Giorgio Moroder’s synthesizer. Inspired by the Surrealist initiative of the exquiste cadaver -the image of Lenin and disco is as absurd as it is joyful. The Beatles reminded Russia there was such as thing as freedom. Lenin and Travolta- The Bee Gees and propaganda for the masses- Surrealism dancing – ‘Boogie Nights’ celebrates the liberating effect on mind of music & art in culture in a way that only Bracey/Furr could do in a one-off piece. 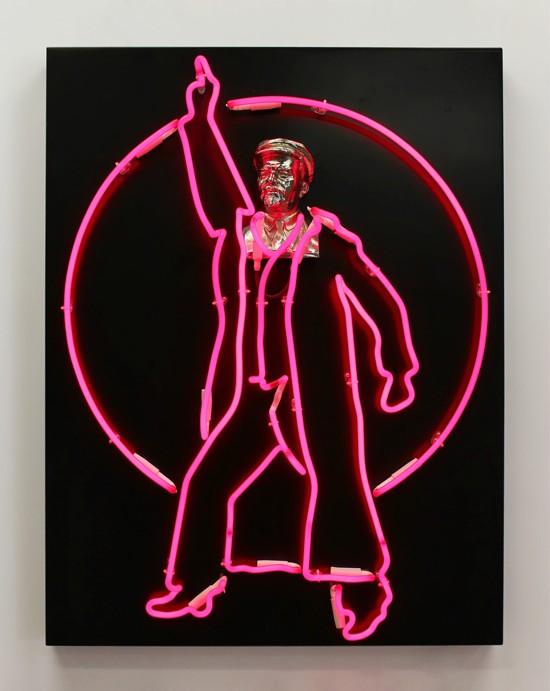 A neon London Lenin.